Sciatica refers to a persistent pain felt along the sciatic nerve, which runs from the lower back, down through the buttock, and into the lower leg. Sciatic pain can feel like numbness or tingling and may run down through the knee or reach all the way through to the foot. The sciatic nerve is the longest and widest nerve in the body, running through the piriformis muscle (which is in the buttock). It controls the muscles of the lower leg and provides sensation to the thighs, legs, and the soles of the feet. When the low back is out of alignment the muscles contract to try to protect the low back. 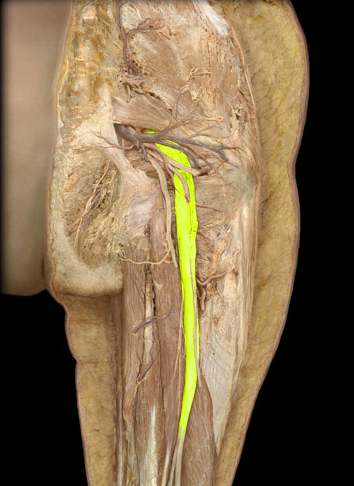 The contracture of the piriformis muscle can squeeze on the sciatic nerve. The sciatic nerve can also be irritated when there is a mis-alignment of the lumbar vertebra or sacrum which puts pressure on nerve. Sciatica occurs most frequently in people between the ages of 30 and 50 years old and those with a highly active or highly sedentary lifestyle. Most often, it tends to develop as a result of general wear and tear on the structures of the lower spine, as opposed to a result of injury. Most commonly, patients who suffer from sciatica experience pain that radiates along the path of the sciatic nerve, from the lower back and down one leg, typically felt on one side of the body. It is important to note that pain from sciatica often begins slowly, gradually intensifying over time. In addition, the pain can worsen after prolonged sitting, sneezing, coughing, bending, or other sudden movements. How can sciatic pain be treated? Chiropractic offers a non-invasive (non-surgical), drug-free treatment option. The goal of chiropractic care is to restore spinal movement, thereby improving function while decreasing pain and inflammation. Depending on the cause of the sciatica, a chiropractic treatment plan may cover several different treatment methods, including but not limited to spinal adjustments, ice/heat therapy, ultrasound, TENS, and rehabilitative exercises. In general, sciatica is treated by corrected the mis-alignment, performing muscle work to relax the muscle, and with flexion/distraction. Flexion/distraction is a treatment in which the vertebrae are gently separated to take pressure off of the disc and nerve.